The glories, grandeur and greatness of the city. These are the Seven Wonders of Manchester; wondrous places, majestic settings, extraordinary stories: the world’s biggest trading room, a Cathedral of Culture, masterpieces of religious art, an unforgettable Gothic shrine, tens of thousands of faces forming one famous face and a celebration of Manchester’s greatest gift to the world – work. The 7 Wonders of Manchester, the world’s first industrial city, capital of the North. 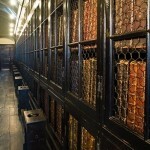 • Chetham’s, the oldest library in Europe built into the 15th century Tudor buildings in the heart of mediaeval Manchester. • The Royal Exchange: once the world’s biggest trading floor, now home to a futurist-looking and world-renowned theatre. 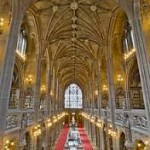 • The John Rylands Library Reading Room. Fashioned like the nave of a Cathedral, lined with statues of some of history’s greatest figures. • The extraordinary Stations of the Cross paintings in St Mary the Hidden Gem, the oldest post-Reformation Catholic church in the country. 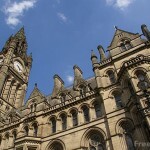 • Manchester Town Hall: a glorious Gothic Gormenghast. • Ford Madox Brown’s monumental Work: Manchester’s greatest painting, explained, outlined, resolved in wondrous detail.